New York City crushes the fine-dining game, but sometimes the only way to curb cravings is by visiting a classic, old-fashioned diner. There's something timeless and nostalgic about a no-frills (and no-res-required!) spot where you can order everything from fluffy banana pancakes to a classic griddle cheeseburger to a malted chocolate milkshake -- and all of it at 2am. Convenience, fast service, and a cornucopia of menu items are the hallmarks of truly great diners, and NYC has no shortage of them. From iconic, decades-old institutions to round-the-clock neighborhood gems, here are a dozen of the city’s top greasy spoons. Though it underwent a renovation and expansion in 2011, this old-fashioned, cash-only Greek diner still looks frozen in time with padded vinyl booths, peach curtains, and dark wood paneling. It offers the same familiar menu, as well, 24/7: buttermilk silver dollar pancakes, malted milkshakes, thick-cut steak fries, Italian-American specialties, and just about anything else you could want. Regulars often settle in for the extensive egg offerings (more than three dozen varieties of omelette alone), which come served in a steel skillet on a wooden board. Don’t let the fancy name fool you: this cash-only dive slings cheap American eats in an unassuming setting, complete with bright blue vinyl stools and a Formica counter. A refreshing change for the posh West Village locale, it’s the place to enjoy simple-yet-satisfying food -- stacks of pancakes, omelettes anyway you like 'em, old-school milkshakes -- and maybe catch a celebrity sighting. All for only a few bucks. Not much has changed at this tiny Eastern European diner since it opened more than seven decades ago. Step up to the counter of this vegetarian hole-in-the-wall for kosher comfort food staples: matzo ball soup, meat-free borscht, plump pierogies, cheese blintzes, and knishes. Check out the rotating daily specials, and don’t miss the challah French toast (a steal at $6.50). 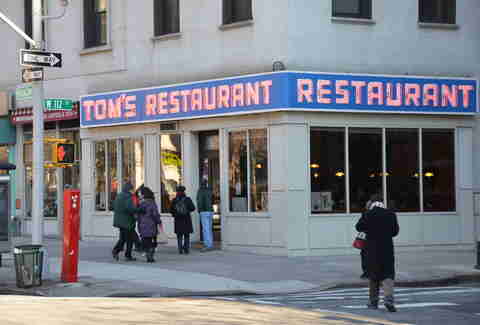 Seinfeld fans know that the fictional Monk’s Café featured in the sitcom was really Tom's. 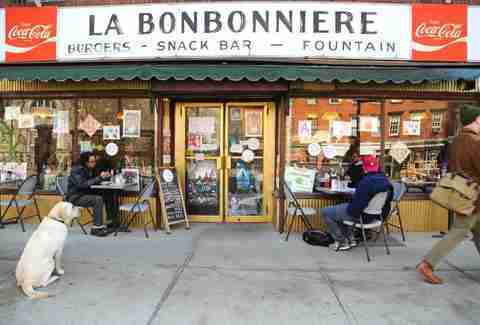 This Greek family-owned shop has been around since the '40s, serving solid no-frills diner fare and bottomless cups of coffee to TV show devotees, Morningside Heights residents, and Columbia students (ordering a milkshake and gravy fries at 3am is basically a rite of passage). 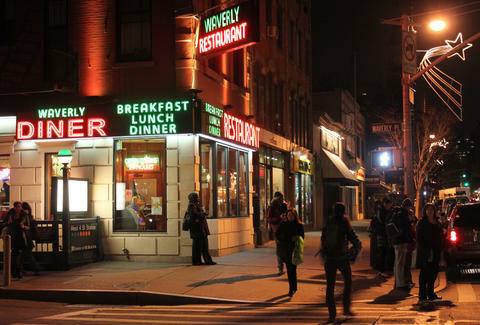 Tom's also claims to have the best milkshake in New York; we’ll have to ask Kramer about that. 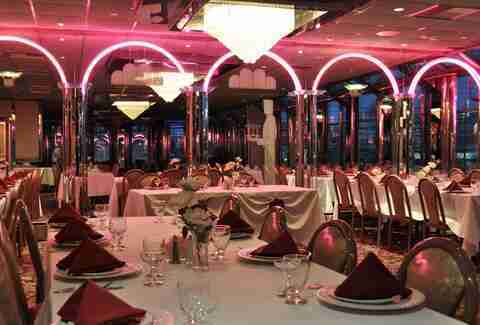 Astoria is Queens' Greek capital, so it's only fitting that the heart of town boasts this grand Greek diner -- complete with mirrored walls and nostalgic neon accents -- that dates back to 1965. The all-day-and-night menu is massive, and spans everything from Mexican (huevos rancheros, pulled pork quesadillas) to Americana (chocolate chip pancake sundaes, triple decker turkey clubs), but when in Athens, do as the Greeks would: go for the stuffed grape leaves, Athenian burger on pita bread, or Souvlaki platter with all the fixin's. 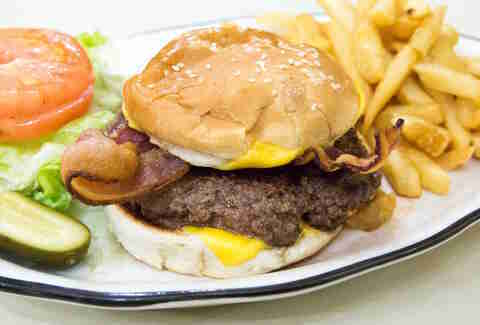 The epitome of a greasy spoon establishment, this cozy 3rd Ave spot offers all the typical American eats, but it’s also the place to go when jonesing for a classic, diner-style cheeseburger that's ranked amongst the city’s best. Made from ground beef chuck and cooked on a well-seasoned flat top griddle, then topped with American cheese and crispy bacon on a seeded white bun, this baby is simple, unpretentious, and always satisfying. You may recognize this place from an early scene in Goodfellas (when Paulie and Jimmy steal the truck from the diner parking lot) -- it's a quintessential Queens landmark right off the Grand Central Parkway (originally the Airline Diner built in 1952). The family-owned joint looks about as old-school Americana as you can get with buzzy neon signs, tabletop jukeboxes, and vintage vinyl booths. Dive into one of the two dozen signature “bronco" chicken specialties and a tasty root beer float, or go straight gangster with the 7oz, house-aged beef burger. 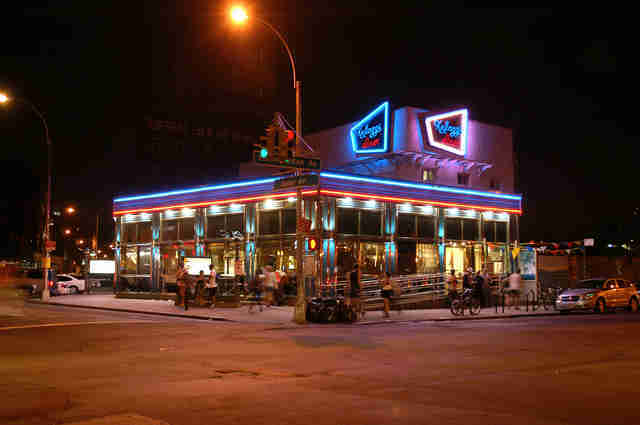 Open round the clock, this Williamsburg standby offers standard diner fare in a (relatively) updated setting, following a makeover in 2008. Expect everyone from neighborhood regulars who always order the baked meatloaf to hipster night owls stopping in for post-bar- crawl burgers and mozzarella sticks. Be warned: it’s hard to resist the temptation of the dessert case, with its rotating assortment of sweets like banana cream pie, tiramisu, and Oreo cheesecake -- and the added scoop of ice cream goes without saying. The classic corner diner on Canal seems to have nailed its recipe for continued success: quality food, fast delivery, and great customer service, all at a palatable price. Snag a counter seat (if you can, there’s only a dozen) for generous portions of all the greatest greasy spoon hits: eggs to order, fluffy pancakes, stacked sandwiches, or fried anything. Open daily from early morning breakfast through late lunch. 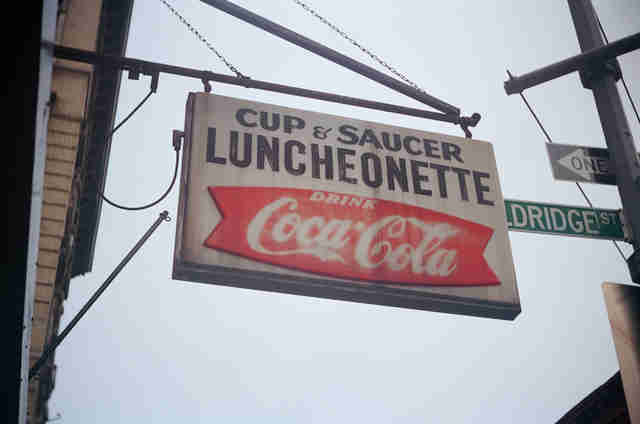 The fact that this tiny diner has survived since the '50s in its ritzy Tribeca 'hood means it must be doing something right. Charming red vinyl booths and shiny silver pervade the triangle-shaped (not square!) eatery, along with a super-extensive menu of breakfast basics, hearty salads, and killer sandwiches. The move here: get Teddy's Special Sandwich (a not-too-mayo’d homemade chicken salad and bacon melt with sharp cheddar, tomatoes, and onions on toasted seven-grain bread) and a wonderfully frothy egg cream. There’s also a 4-7pm weekday happy hour with beer, wine, and cocktails for just a few bucks a pop. If you ever find yourself on Staten Island (hey, it can happen! ), stop into The Colonnade to step back in time -- or just to peep the ’hood where Wu-Tang rose to fame. Oozing with old-school gaudiness, this family-owned-and-operated landmark is a total throwback with tried-and-true diner food. You’ll find all the expected platters, piled high sandwiches, pastas, and seafood specialities, along with hearty entrées in the “Roasts, Steaks, Chops & Birds” section of the menu. Tucked beneath the elevated 7 train platform, this beloved, family-owned shop dishes out one of the best breakfast deals in town: coffee, juice, eggs, and a donut for just $3.95 (with bacon for a buck more). 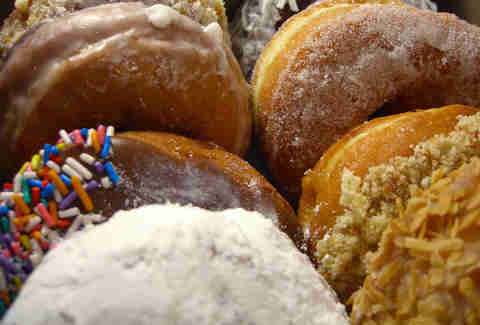 In addition to breakfast, the specialty here is -- you guessed it -- donuts. From the featherlight glazed best-seller to vanilla and chocolate frosted, these daily-made delights sell out quickly during the morning rush, so get there early to ensure your favorite isn’t wiped out. Craving a cruller at 3am? Alpha’s got you covered, serving food all night long. Cue Lionel Richie. Megan Murphy (aka “This Girl Can Eat”) is a contributing writer at Thrillist and a self-proclaimed pro at the late-night diner order. Follow along on her culinary adventures on her website, Twitter, and Instagram.